If your e-commerce business is growing but you haven’t yet implemented ERP integration, your business may be at risk. Every time you manually enter sales orders on your ERP, adjust your inventory or upload updated product data onto your website, you’re spending more time and energy than necessary. You’re also increasing the possibility of errors, which are never good for business. Reliability and trust are key for retaining customers. Any of the above issues can negatively impact your customers’ experience and therefore your business’s reputation and success. Instead, why not streamline your processes and enhance your business with ERP integration? In short, integration helps you get both systems on the same page. Let’s look at why that is so good for business. Increased control and reduced operational costs for your business – resulting in greater efficiency and higher profitability. When any customer orders an item, only to be told afterwards that it is out of stock, or a B2B customer gets one price from your rep and another price from the website, the result is frustration all round. If customers know the information on your site is always accurate, it generates trust and they are far more willing to do business with you. With your ERP system feeding directly into your e-commerce site, your customers always – even over weekends or at midnight – have access to real-time data. They can check live inventory levels and see the exact status of their order and/or shipments any time they choose. There’s no need to phone a rep or a call centre when customers have all the information they need at their finger tips. In the case of B2B customers, they have access to tailored data, including their specific prices, account overview and history. This leaves you and your sales team free to deal with customers who really do need assistance, or to explore opportunities for growth. When pricing, inventory levels and product data are automatically maintained, human errors like duplication, finger slippage and double data entry are minimised, if not eliminated, saving you time and money. 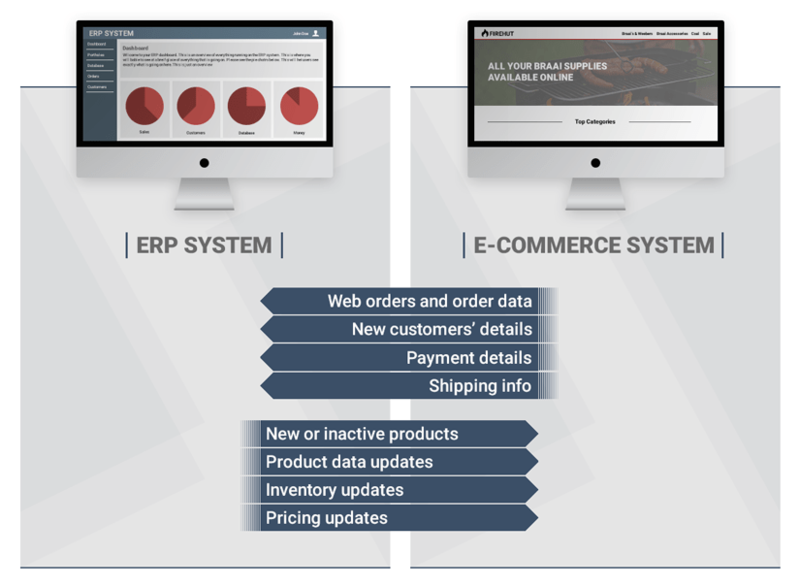 Sales orders are transferred directly from your e-commerce store to your ERP system. This automation again minimises errors and saves time and effort. The order fulfilment cycle can start immediately, dramatically speeding up your turnaround time. As online sales are instantly updated in the ERP, so are inventory levels. Therefore you can plan your purchasing much more accurately. You’ll know exactly which products are selling, and how much to order to minimise back orders or to avoid out of stock situations, reducing both admin and loss of revenue. When the data flow between your two systems is reliable and accurate, your sales personnel can confidently sell what they see on the system. Your financial reporting becomes more accurate too, automatically including both your e-commerce sales and ordering data. This improves your overall insight into your business and allows you to manage it much more closely. There are many benefits of ERP integration with your e-commerce store. To get the most from it, be sure to select a partner who is an expert on the business process implications you need to consider, and can guide you through them. Then you’ll never look back. If you’re still wondering whether ERP integration is for you, contact us to chat through the process. We integrate with many ERP systems across both our B2C and B2B software.